What a wet Wednesday morning! Luckily things have begun to taper off, but not without achieving an impressive .25” of rain in the past 12 hours. 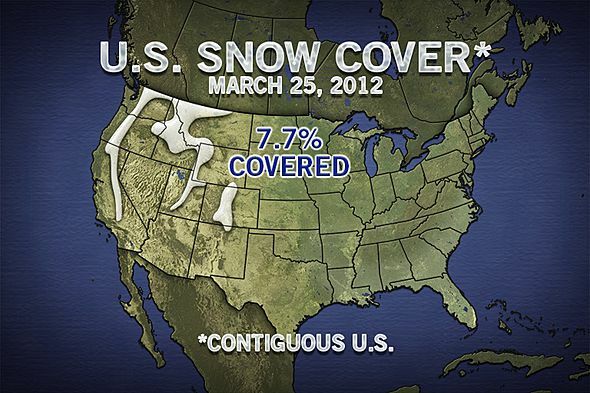 By the time March rolls around, we start to say things like, “Well, surely the snow can’t stick around much longer. 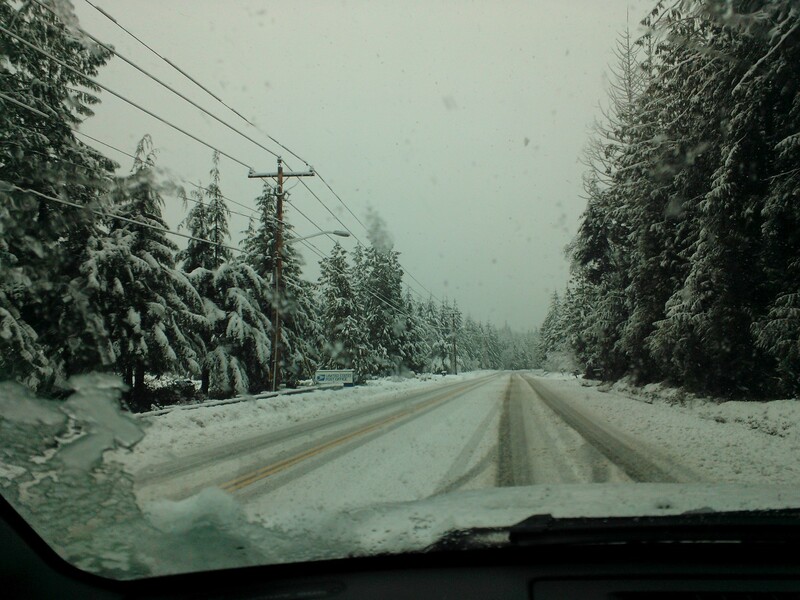 Winter is nearly at its end!” And then after a few more bouts with snow, especially in and around the convergence zone, we tell ourselves, “This is the last one. 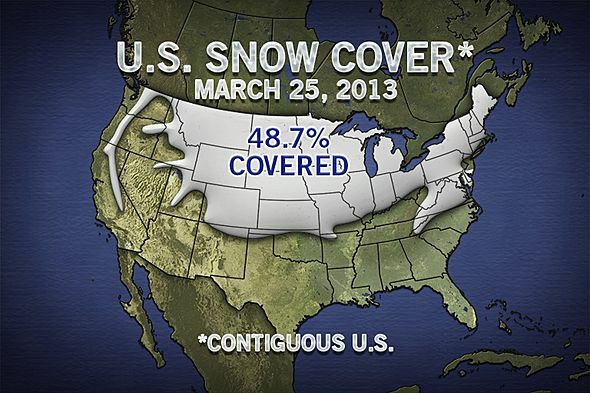 I’m sure of it!” Of course, by April snow is a thing of history. We’re sort of experiencing that same attitude here with cold, rainy days. Surely it will end soon, right? April and May are the transition months from relentless rain to glorious Northwest sun. In fact, our summers are typically very dry in comparison to our winters. July averages only 0.86” of rain, which is less than we’ve experienced in the past 3 days! 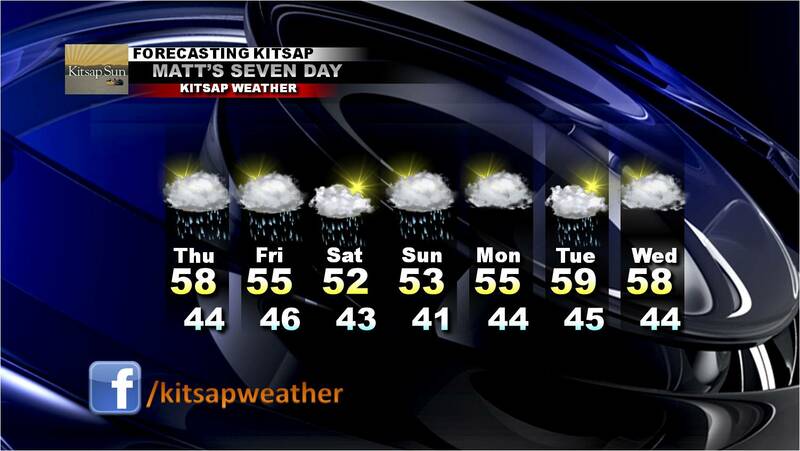 With that said, today will be the last real soaker in a while. Forecasting models have been fighting over whether we’ll experience periods of troughing through the weekend (cooler weather with sprinkles) or ridging (warmer weather with sunshine). Either way, after Thursday it doesn’t look like we’ll be seeing much in the way of any rain. Therefore, after Thursdays showers and sunbreaks, expect partly to mostly sunny skies from Friday through the weekend and into next week. Morning clouds and drizzle will definitely be a consistent pattern, but with the afternoon clearing high temperatures should manage to climb into the upper 60s to low 70s. This should make the upcoming weekend the nicest we’ve seen in at least two weeks! In fact, the long range forecast models indicate we won’t be seeing much in the way of steady rain for several more weeks. This certainly makes sense, because just as March and April feature less and less in the way of snow showers, June and July feature less and less in the way of rain showers. Stay tuned for Saturday’s blog post, which will discuss what “meteorological summer” is all about. I know, this is exactly what everyone wanted to hear! Now, those who know me understand I don’t like national weather companies, but the Weather Channel is pretty good overall (this does not mean you should bookmark their weather page for your forecasts! That’s why I’m here ;)) and seemed to do a good job predicting the overall weather pattern for our neck of the woods thus far. Did anyone notice how they started out saying the jet stream would sag for the eastern half of the nation and it showed “warm” temperatures for the West next month, yet they produced a second map showing we would actually average colder than normal for February? Not sure what that is all about, but with the jet stream acting that way there’s one thing we can be sure of: We’re in for a lot more dry weather. 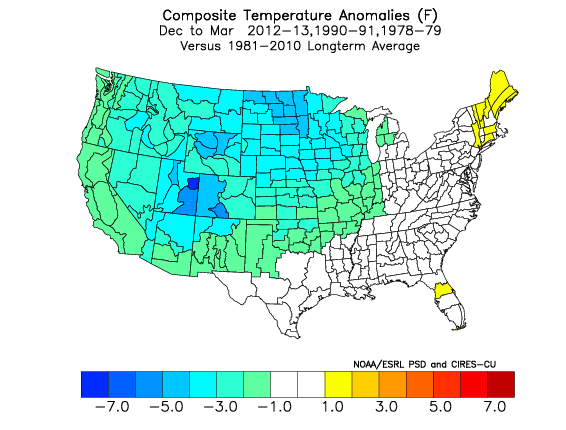 Not too surprisingly, they are calling for a colder than normal March and a MUCH colder than normal April. Yeah, that El Nino kind of bombed…big time. My thoughts generally coincide with the Weather Channel’s, although I am noticing strong indications of a warmer and drier than normal February. We’ll see. In the weather world, 2013 has started off slow and seasonable. Latest weather models indicate that may not be the case much longer as we dive deeper into January. 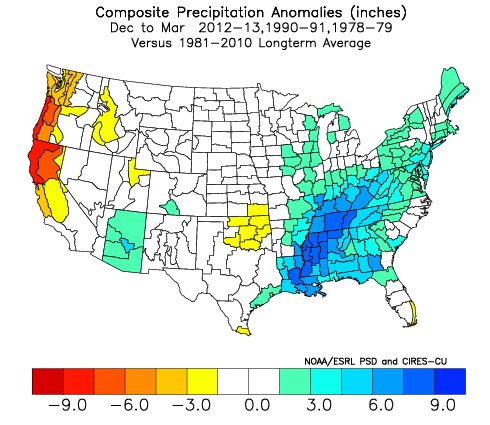 Remember when we talked about the implications of a neutral weather year (ie no La Nina or El Nino pattern)? This winter has lived up to its “wildcard” name, and it will continue to drag surprises under our feet from time to time. 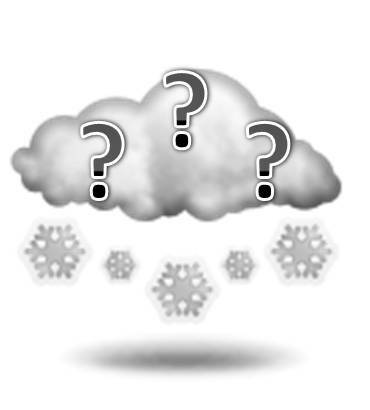 There are several weather systems to keep an eye on, the first being tomorrow afternoon. Moderate, steady rain and warmer temperatures will move into the area around 1-2 pm tomorrow and last most of the night. Most areas around the peninsula will add up to anywhere from 0.30”-0.65” of rain by Monday morning. The flow switches westerly throughout the day Monday signaling a small rain shadow for large portions of the Kitsap peninsula. Tuesday will be the day to watch in terms of precipitation. Locally heavy rain (most especially along the Hood Canal) will spread into the area early Tuesday and persist much of the day. How heavy? Hood Canal communities may come away with anywhere from 2-4” of rain before the event is over. Models are also hinting at some strong wind as well, although this will need to be monitored before more stock is put into how much wind and where. Temperatures will be seasonable, reaching the mid 40s. Yes the rumors are true: we will be getting a little colder around here. However, nothing at this point is looking really impressive. Latest forecast models show little precipitation in the Wednesday-Saturday time frame with temperatures dropping into the 30s and lower 40s with overnight lows in the upper 20s/lower 30s. 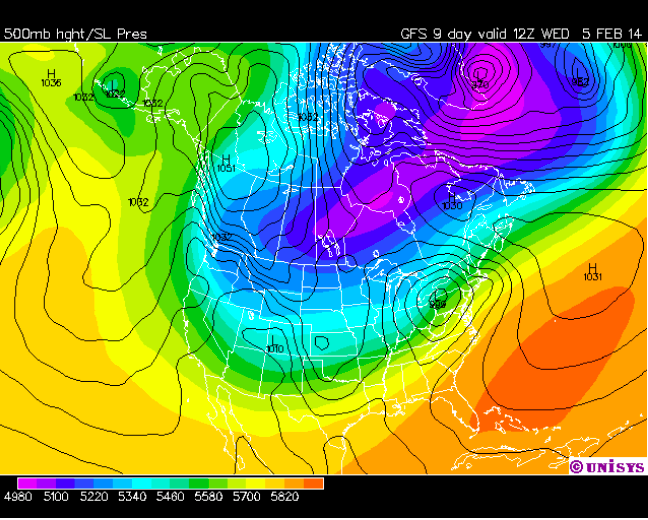 So yes, it will be getting colder, but so far it doesn’t appear we’ll rival late December’s snow or cold temperatures. 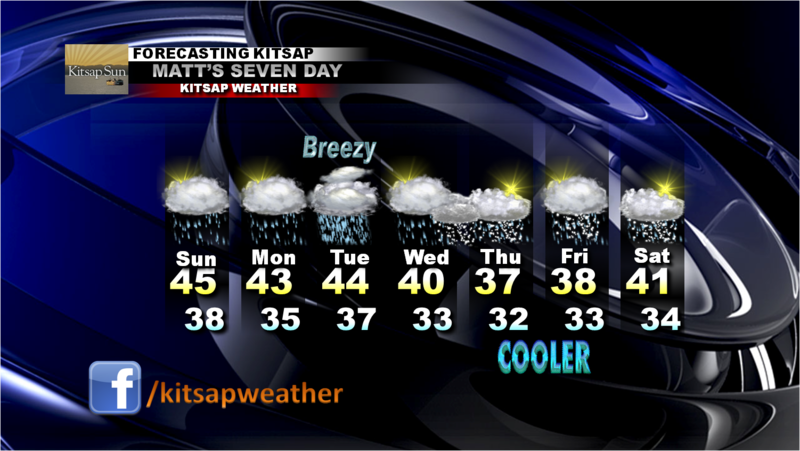 Right now it would be safe to bet on a few rain/snow showers late Wednesday night through next weekend, with an increased chance of sticking snow along the Hood Canal Friday/Saturday. Again, temperatures will still be marginal and we lose a lot of moisture, but the potential is there. 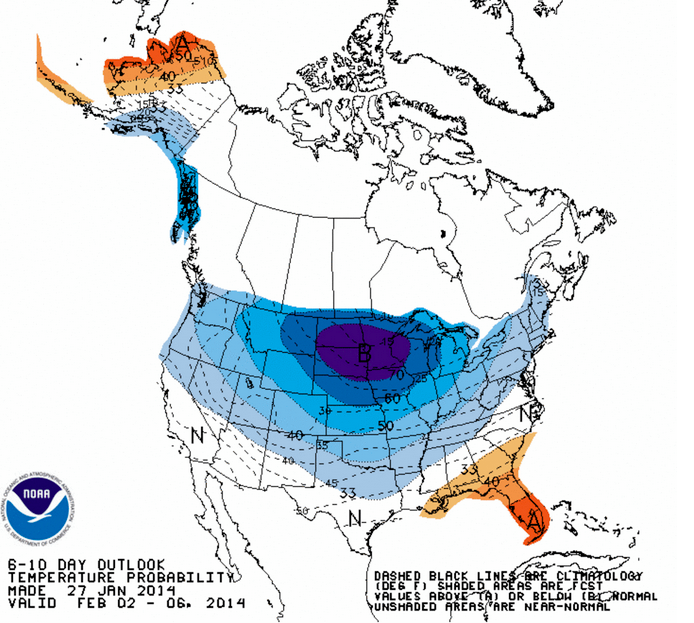 LONG RANGE: SOME SERIOUSLY COLD AIR COMING OUR WAY? Although this upcoming week/weekend doesn’t look too prime for any dramatic snow or cold events, that doesn’t mean there’s nothing in the future to keep an eye on. Longer range forecast models (6-14 days out) have consistently suggested a colder, but drier weather pattern to take hold by week 3 of this month. While still too early to discuss details, consistency in the general theme of entering a fairly cold pattern in mid January has been impressive. As always, I’ll keep my eye on these storms for you. In the meantime, be prepared for the next 72 hours to feature wet and potentially windy weather around here.